So I saw a picture of cookie stuffed Oreos on Pinterest (of course- follow me here), showed it to my dad, and decided to recreate yesterday! All you need is a chocolate chip cookie recipe (I used one out of a Kitchenaid mixer book), the ingredients of course, and a box of Oreos! 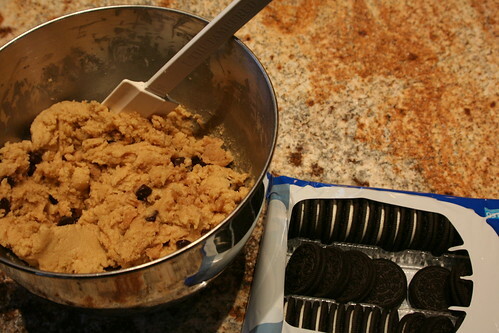 Step 1: Make your cookie dough and bring out the Oreos! 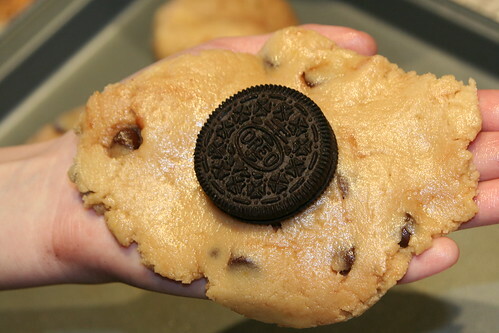 Step 2: Put Oreo in the cookie dough and wrap around. 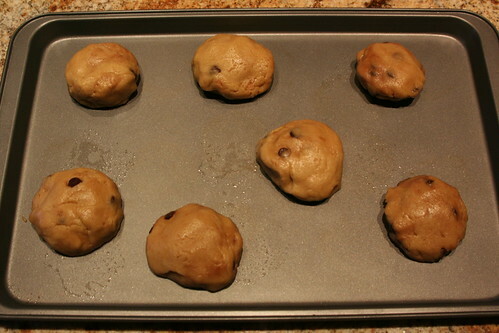 Step 3: Place cookies on the cookie sheet. Step 4: Cook them! 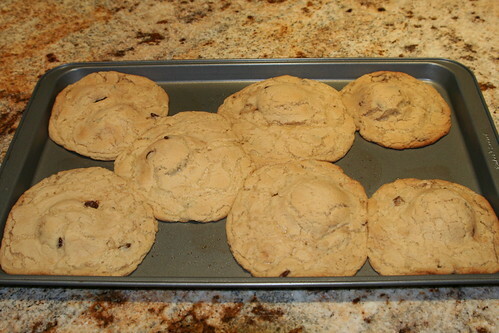 Note: I put a little too much cookie dough around the Oreos so that is why they expanded so big! So maybe use as little as possible to cover the Oreo! 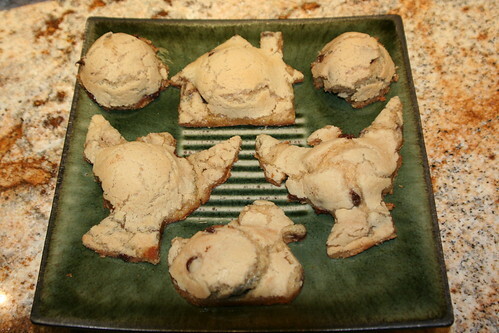 Step 5: Cut the excess cookie dough with the biggest cookie cutters you have in the house [if you make my mistake :) ] You may end up with a house, eagles, and a duck haha. Or you can just cut a circle around the Oreo! Step 6: Get milk and enjoy! 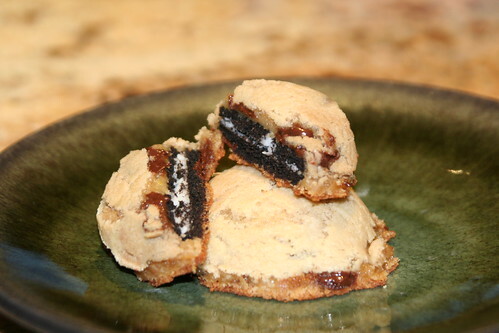 If you don't love Oreos and don't love cookies then this will not be the right cookie for you! It is kind of intense but a fun try for the kitchen! YUM!! Oh I am SO making this... and then I will eat them all in one night. And I might share with my husband. MIGHT. These sound awesome! I'm making them tonight! they were a hit at work as i showed em off. they were really yummy. gave me a bunch more ideas too. Yuuuuuuuuummm!!!!! :D thanks! I'll be making these soon! hey girl! i blogged about courage to hope today if you wanted to post about it or something. love you! I saw these somewhere recently too and MMMM my mouth is just watering. I'm so glad that you posted a recipe here:) Good one, girl. OH EM GEEZE. These look amazing!!! MUST TRY NOW! Just found your bloggy, btw. 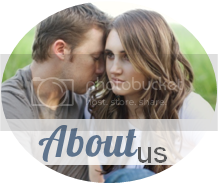 Love it and am your newest follower! Hooray! yeah, genius in my book. Okay I am so mad at you right now. These look AMAZING! You talented LADY! Thanks for linking up sista!